Bees live on nectar and pollen (and water and minerals) that they gather from the flowers of plants. Not all plants have the same ability to secret nectar or to create exorbitant amounts of pollen in order to attract honeybees and other pollinators. Indeed, plants that can produce a vast nectar flow are not very numerous. We know them throughg the speciality honeys we can buy like maple, fireweed, clover, linden (basswood) just to name a few. So, what should we plant in our garden or yard to attract honeybees? First and foremost: Almost all that nourrishes and sustains us humans is also beneficial for the bees: fruit trees, most vegetables (just enlarge your garden by 10 to 20 percent and let the surplus plant go into bloom), berries and herbs. Second: Select trees with great potentials for a honey flow, for example maple, chestmut, linden, honey locust or black locust, cascara. Furthermore, many trees/brushes are very important as early pollen sources like hazelnuts, (filberts), indian plum, alder, mountain ash. 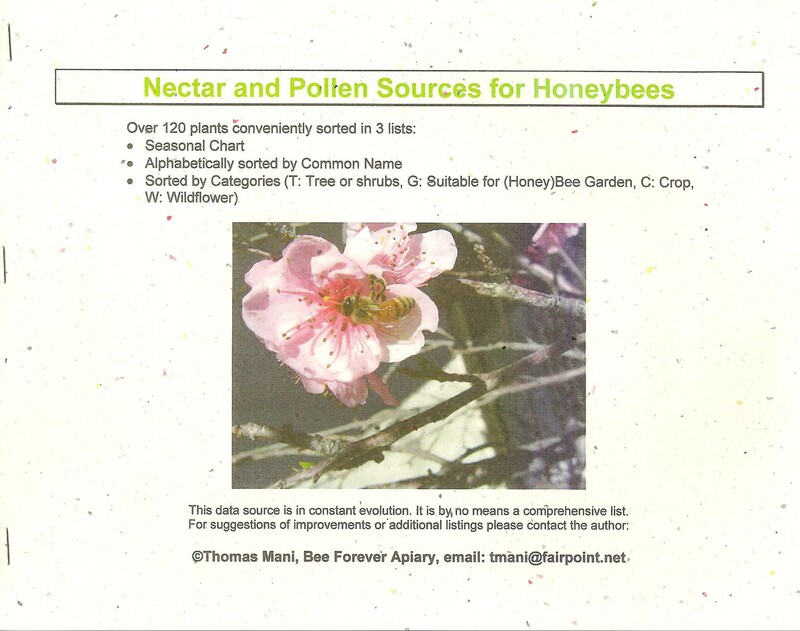 We have created a list with over 120 plants that the honey bees love to visit. The entries were collected from various sources and screened to fit the Pacific NW. It is conveniently sorted in three ways: by flowering season, by common name, and by categories (tree/shrub, garden, wildflower, crop).